My favorite Dr. Seuss books are not conducive to movie adaptations. No matter what comedic genius you've got doing the voices, I don't think you can tease a plot out of "There's a Wocket in My Pocket" and there's probably not much family appeal to "Dr. Seuss Goes to War: The World War II Editorial Cartoons of Theodor Seuss Geisel." 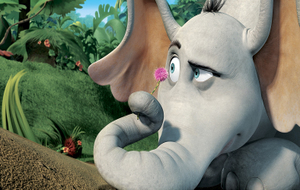 But "Horton Hears a Who" hit theaters this weekened and, as expected, made an elephant-sized bundle. The movie is an animated tale of Horton the Elephant (Jim Carrey) who struggles to protect a microscopic community who drifts into their jungle community on a speck and lands on a clover. Horton spends most of the movie trying to protect the tiny community from his neighbors who refuse to believe it exists. Horton commits to get Whoville to a safe flower on top of a mountain and Horton means what he says and says what he meant, so despite the trials of the know-it-all kangaroo (voiced by Carol Burnett to perfection) and the turning of the entire jungle on him, he journeys across chasms, faces the attacks of a cut-throat vulture and nearly loses the clover with the speck on the way to that mountain. Horton's partner in crime is the Mayor of Whoville, the father of 96 daughters and one son (talk about creat ing daddy issues). Combining his stressed everyman persona with his slightly-incompetent Michael Scott air, Steve Carrell provides the voice of the other lead and does a great job of it. While Carrell's efforts only occasionally remind viewers of his comedic history -- he blends perfectly into the universe and you forget who the actor is. The same can't be true of Jim Carrey. Carrey is very much a horseradish actor -- a little of him goes a very long way. For the most part, this movie does a good job of reeling his insanity in and giving a sweet and coherent tale about an elephant who cares about people of all sizes, no matter how small. Unfortunately, his ability to improvise and his penchant for physical comedy is incorporated into the story. Instead of being a sweet dreamer, Horton is a little too manic for my taste. I went with two small children (which is the best way to see a children's movie) and they seemed to enjoy almost every part. What they didn't enjoy, though, they REALLY didn't like. About midway through the movie Horton is chased by Vlad the vulture (not to be confused with Vlad the cookie-bearing rabbit) and the scene is a little intense for the elementary and toddler sets. I spent those 10 minutes with a usually independent three-year-old on my lap with a death grip on my neck while the six-year-old grabbed her mother's hand and whimpered a couple of times. The other scene which probably had every parent with dental insurance wincing was one in which the bumps from the outside world cause earthquakes in Whoville, just as the Mayor of Whoville goes to the dentist office. 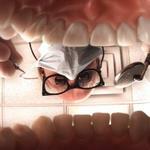 The dentist eventually whips out a giant needle. Add in a few tremors and, voila, every child's worst fear about the dentist is about to come true. Thanks to a quick cutaway, the movie never goes that far, but children are easily impacted and the scene is completely unnecessary. For studios, a good movie is a good movie, as long as the box office isn't too small. And, unlike past Dr. Seuss adaptations, this is a sweet story that the studios didn't ruin and will make them plenty of cash, 100 percent. Ouch. There are movies like these that actually contribute to dental trauma, even before the kids actually sit on the dentist's chair. Have you tried motivating them after they watched the movie?